Pumpkins and squash have been grown in North America for thousands of years. Native Americans ate pumpkins roasted, boiled and stewed, and they roasted the seeds for food as well. Most pumpkins now are used for jack-o-lanterns or pumpkin pie. There are many different cultivars of pumpkins (Cucurbita cultivars) grown in South Carolina. Winter squash and pumpkins are closely related. The commonly grown types of winter squash are buttercup (Cucurbita maxima), butternut squash (Cucurbita moschata) and (Cucurbita pepo). The jack-o-lantern and acorn squash types of pumpkin are Cucurbita pepo, and giant pumpkins such as ‘Big Max’ are Cucurbita maxima. All types of squash and pumpkins are highly susceptible to frost and should be seeded in the garden after all danger of frost is over, and the soil temperature at a depth of 4 inches is above 60 °F. Winter squash and pumpkins can be planted either in late spring or in midsummer. 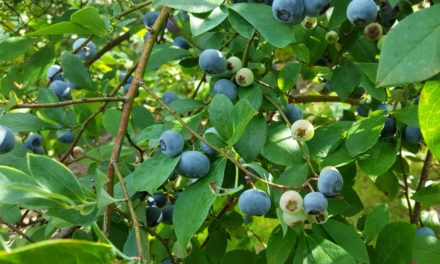 Those planted in the spring need to be used several weeks after picking because their quality deteriorates more quickly than the quality of those grown in the fall. However, earlier planted crops are less subject to insect and disease attack and may be more desirable if they are grown for processing. Pumpkins for ornamental use should be planted in mid to late summer depending on the time needed for the variety selected. Maturity of pumpkins varies from 70 to 120 days, depending on growing conditions. Most varieties of pumpkins should be planted by early July to ripen in time for Halloween. Pumpkins and squash are adapted to most South Carolina soils. The soil should be well-drained with a soil pH of 6.2 to 6.5. Planting on a raised bed promotes drainage, so the roots do not have to deal with constant wetness, which leads to disease problems. Avoid poorly aerated soils, soils with nematode problems or fields where other cucurbits have been grown in the last three years. Squash and pumpkins are usually planted in hills. Plant two to three seeds per hill about 1 inch deep and thin to one plant per hill. Spacing varies with variety and vine size. Plant bush or short-vined varieties 2 to 3 feet apart in rows 3 to 5 feet apart. Large-vined varieties should be planted 3 to 5 feet apart in rows that are 6 to 8 feet apart. It is best to base fertilizer application on the results of a soil test. If a soil test is not taken, apply 5-10-10 fertilizer at 30 pounds per 1000 square feet before planting. If pumpkins will be grown after a legume or another green manure crop, less fertilizer is needed. When the first blooms appear, apply a side-dressing of calcium nitrate at 2 pounds per 100 feet of row and water it in. Place side-dressing fertilizer 6 to 8 inches from the plants on both sides of the row. More frequent side-dressing may be required if the garden is sandy or if leaching rains occur. Do not over fertilize with nitrogen because this encourages excess vine growth and suppresses fruit growth. Water the garden to provide a uniform moisture supply to the crop. Keep the leaves and fruit dry when watering and avoid overhead sprinkler irrigation. Water sufficiently to moisten the soil to a depth of 6 inches. Light sprinklings will encourage shallow rooting of the plants. The critical period for moisture is during fruit set and fruit development. Plastic Mulch: Squash and pumpkins can be grown with black plastic mulch. The black plastic absorbs the sun’s warmth, allowing the soil to warm quickly. To plant, punch a small hole in the plastic and plant the seed or transplant. The black plastic will warm the soil faster in the spring and will also conserve moisture throughout the season. Other advantages of this type of mulch are weed control and a reduction of fruit rot. It is best to use drip irrigation in conjunction with the plastic mulch. Using drip irrigation instead of overhead irrigation keeps the foliage dry and reduces disease problems. It is also possible with the appropriate equipment to inject the needed nutrients through the drip line and spoon-feed your plants. Organic Mulch: Mulching with organic matter like pine straw or wheat straw helps control weeds, conserves moisture and keeps fruit from direct contact with the soil, where they could be infected by diseases. If wheat straw is used as mulch, apply an additional half-cup of calcium nitrate when side-dressing. Weed Control: Pumpkins have many important feeder roots near the surface and roots grow to about the same spread as vines. Weed control can be difficult after the vines have spread. 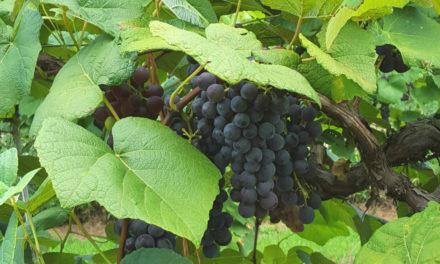 Be especially careful when cultivating near the main stem and do not move them after the fruit have formed because they are brittle and can easily break. To grow big pumpkins for exhibition, select one of the following large varieties: ‘Big Max’ (matures in 120 days) or ‘Big Moon’ (115 days). These huge fruit are popularly grown for contests, but they usually do not have the rounded jack-o-lantern shape best for carving. The fruits can weigh up to 50 pounds or more in the Piedmont. They are partially resistant to downy mildew. Prepare each hill (50 to 60 square feet per plant) by incorporating 4 to 6 bushels of manure or compost and 1 to 2 pounds of 10-10-10 into the soil. Mix in deeply. Plant three to five seeds per hill and thin to a single plant. Apply ½ to 1 cup of nitrogen fertilizer near the perimeter of the vine every two to three weeks, beginning three weeks after seeding. Keep plants well-watered, and allow only one fruit to develop on each plant. Immature squash and pumpkins do not store well; therefore, be sure that fruit is mature before harvesting. Mature winter squash have very hard skins that cannot be punctured with your thumbnail. In addition, the fresh, bright, juvenile surface sheen changes to a dull, dry-appearing surface. Harvest only solid, mature pumpkins with deep orange color. Cut the fruits from the vine, do not tear them. Leave a generous stem, also called a handle. Be careful not to injure the rind or break off the stem, as decay fungi will attack through wounds. Do not harvest or handle wet fruit. Do not let harvested fruit get wet. After harvest, wash with soapy water to remove surface dirt. Then dip fruit in a dilute chlorine solution of 4 teaspoons bleach per gallon of water, or wipe with a clean cloth dipped in chlorine solution. Allow fruit to dry, but do not rinse until use. Curing involves maintaining storage temperatures between 80 to 85 °F with 75 to 80 percent relative humidity for approximately 10 days. Store fruit at 50 to 55 °F and 50 to 75 percent relative humidity with good ventilation. Under these conditions, squash and pumpkins can last eight weeks or more. Be especially careful to protect harvested fruit from temperatures above 95 or below 50 °F. Diseases: The most common diseases of winter squash and pumpkins are bacterial wilt (spread by cucumber beetles), powdery mildew, downy mildew, fruit rot, and anthracnose. Powdery mildew can be a particular problem on late-planted squash. It is the most common and damaging disease of pumpkins. Disease control should start with cultural tactics. One of the least expensive and most effective disease control measures is crop rotation. Do not plant squash and pumpkins after similar crops such as cantaloupe, cucumber or watermelon for at least three years. Keep the garden and surrounding area free of weeds that harbor insects that can spread viruses and bacterial wilt. To protect fruit from rots, place a barrier under ripening fruits to lift them off the soil. An old shingle is better than paper or plastic, which will trap water. More information about squash and pumpkin diseases is available in HGIC 2206, Cucumber, Squash, Melon & Other Cucurbit Diseases. Insects: Common insects include seed corn maggot, spotted and striped cucumber beetle, squash vine borer, pickleworm, aphids, and squash bugs. In small plantings, the brown egg masses of squash bugs can be handpicked off the plants. Adult squash bugs can be trapped beneath shingles or cardboard placed under the plants and then destroyed. Fabric row covers can be used to protect young plants from cucumber beetles. Remove them during the day when the plants are blooming so the bees can pollinate the flowers. More information about squash and pumpkin pests is available in HGIC 2207, Cucumber, Squash, Melon & Other Cucurbit Insects.